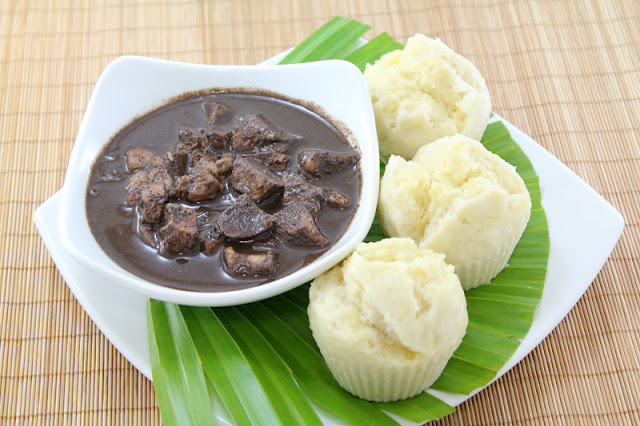 Dinuguan or blood stew is a favorite dish in the Philippines. Filipinos in the past have eaten this dish with rice but some enjoy eating it with puto which is a rice cake that has been fermented. 1 Boil pork until tender and cut into desired sizes. Save the broth. 2 Sauté garlic, onion, and tomato. Add the pork and continue sauteing until liquid has evaporated and meat starts to render fat and edges turn to brown. 3 Season salt to taste and stir once in a while to absorb the seasoning. 4 Add vinegar, broth, and long peppers. Simmer for 10 minutes. Adjust seasoning with fish sauce according to taste. 5 Pour pork’s blood stirring regularly for 5 minutes. 6 Remove from fire and serve hot with steamed rice or puto!